It is only a mile and a half from the mainland, but the water is cold and the tides are strong, and the authorities were confident that no one would escape from what would become the world’s most notorious prison. 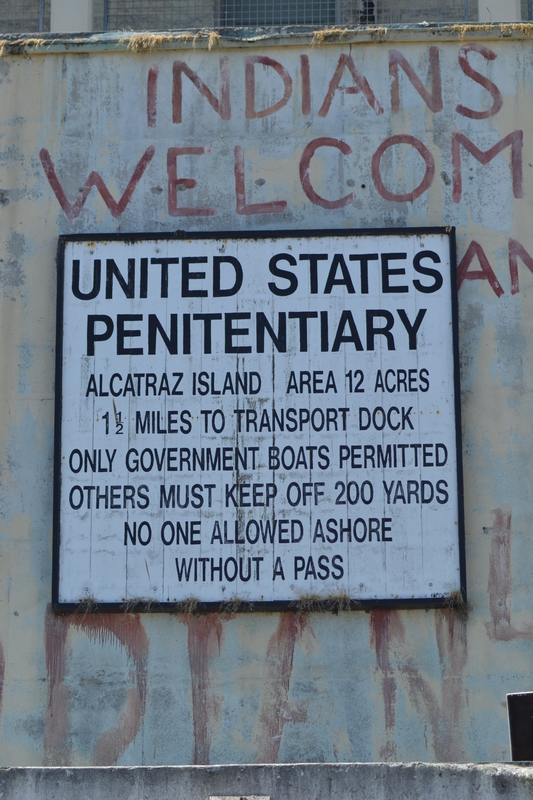 There is still a stern warning as you approach by boat from Pier 33 about the penalty for procuring or concealing escapes, but the old sign is rotten and the letters have faded and it is half a century since Alcatraz closed. Winds howl across the island, gulls screech overhead. 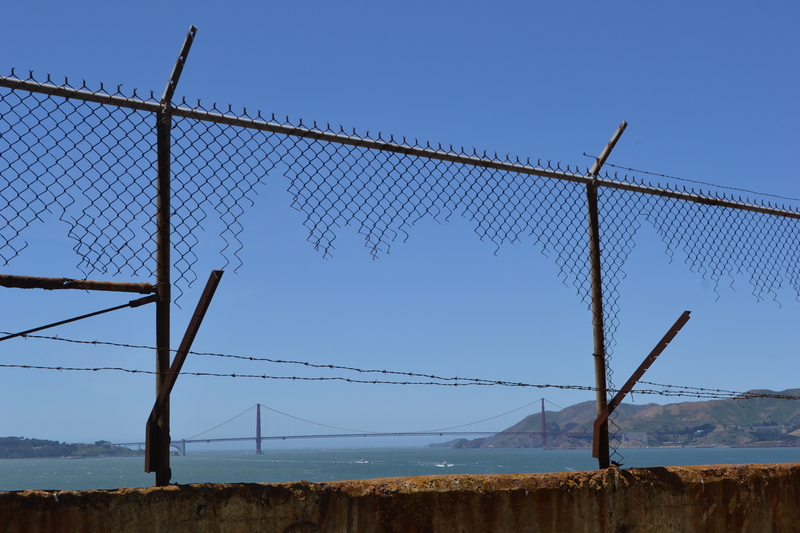 The perimeter fence is threadbare with rust. Paint is flaking, windows are broken, lichen is overwhelming the walls. The concrete is cracked and crumbling in the old recreation yard. 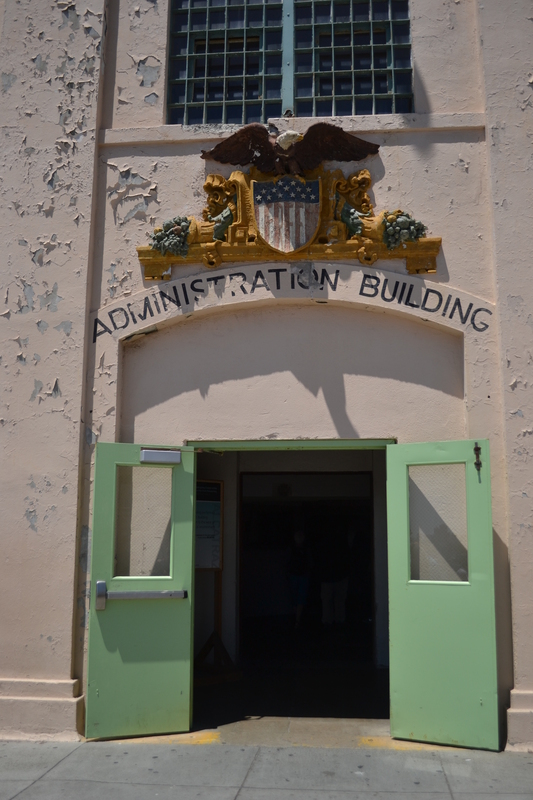 “Knowledge of the outside world is what we tell you,” declared the Warden in Escape from Alcatraz, “…your world will be everything that happens in this building”. But the outside world was teasingly close. The recreation yard overlooked the Golden Gate Bridge. Music and party voices drifted over the water. It is hardly surprising that three dozen inmates tried to escape, in two dozen separate attempts. The only surprise is that there were not more. “No one has ever escaped from Alcatraz,” said the Warden in the movie, “and no one ever will”. But on 11 June 1962, three bank robbers crawled through holes they had spent a year chiselling into the walls of their cells with spoons, into a service corridor, up a ventilation shaft, onto the roof, down the prison wall and over the fence. They left dummy heads made of toilet paper, soap and hair in their beds to fool the guards – which it did until morning – and paddled away in a dinghy made out of raincoats. They were never found, nor heard of again. The movie implies that they got away. Some believe that they did. The evidence they rely on is flimsy, but so is the evidence the authorities relied on to conclude that the escapees drowned. The official version meant that the Warden could carry on boasting that no one had ever escaped from Alcatraz: it saved its reputation with the public. Yet within less than a year it had closed for good. Native American activists occupied the island in 1969; they stayed for nineteen months. Faded ‘Red Power’ slogans are still plainly visible on the prison block and watchtower. The Warden’s quarters are now just a shell, after they were gutted by a fire which got out of hand during the occupation, or – say conspiracy theorists – which was started deliberately by saboteurs out to discredit the activists. Everything on Alcatraz looks to have been left as it was when the last of the inmates departed, or when the occupation ended. It has not, as so often, been repainted, remodelled and rebuilt until you wonder if anything you see is much older than things which you have in the back of the shed at home. The cells, five feet by nine feet, are kitted out as they were with a bunk, a tiny cold-water sink and toilet, and a few are left open so you can step inside. You can wander down the wings, known as Michigan Avenue, Broadway, Park Avenue and the Sunset Strip, into the cavernous dining room secretly fitted with tear gas canisters, and the kitchen with the breakfast menu for the last day the prison was open, assorted dry cereals, steamed whole wheat, scrambled egg, milk, stewed fruit, toast, bread, and butter, and out into the recreation yard. There are none of those stupid interactive exhibits which kids run round trying to break. You are not subjected to tabloid-style propaganda about evil inmates and hero guards and told that crime does not pay and that prison works. There is an audio guide but it is a lot more interesting than they usually are, with a well-thought mix of information – neither dumbed-down nor sensationalised – and accounts by ex-prisoners and guards. Mostly, though, you are just left alone to explore at your own pace and work things out for yourself. I’m really glad there’s none of that extra crap, and the island is allowed to speak for itself. It sounds like it says a lot! This is the way I love to explore – on my own with an audio guide to give me some extra info. Would love to visit this place one day!